At BB Crafts, we offer our selections of these Satin roses that significantly used for decorating, enhancing clothing on special occasions, and making craft projects. You can easily make these beautiful, classy Ruffled Satin Flowers with its lovely look by which you can add value to your giveaway gifts. Apart from this, you can use these flowers in different ways such as flower girl basket, wedding favors, wedding cake and much more. At our online shop these types of flowers available in numerous different colors like red, ivory, blue apple green and much more. Even you can make flower hanky holders, makes beautiful packing gifts for Christmas from these satin/silk ribbons. As they are appealing and unique, you won't find any like these satin flowers in the shops that make your craftwork beautiful. 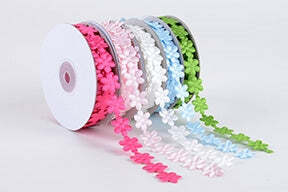 You can wrap these beautiful satin flower ribbons around your gifts, wedding favors and even your wedding cards. You can also add a splash of color like blue, fuchsia, apple green, lavender and turquoise satin ribbons in your wedding function. Although, the white color remains in the majority color of a wedding that gives a stunning look. Make Wholesale purchase with our quality based satin flowers.